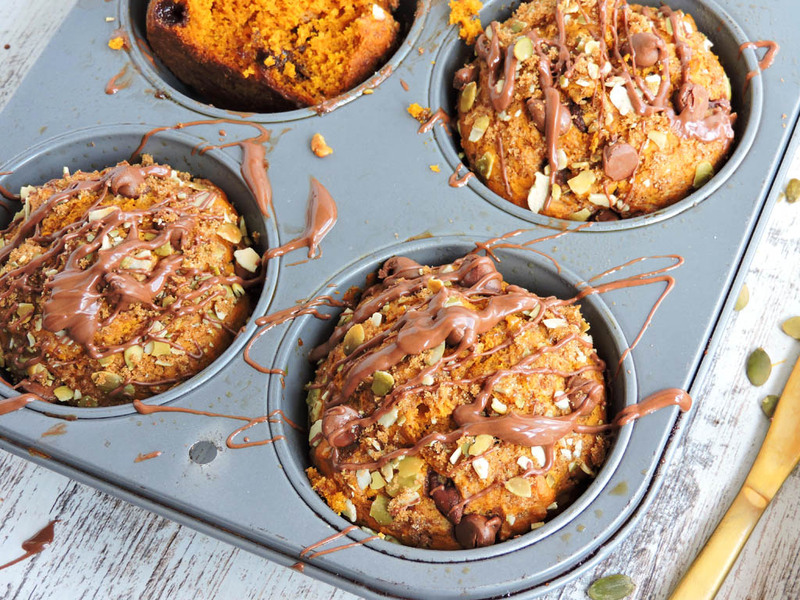 No one can resist these Chocolate Pumpkin Streusel Muffins! It’s the perfect sweet treat for pumpkin and chocolate lovers everywhere! Okay so I think this year, I am completely obsessed with pumpkin! I’ve always loved pumpkin flavored coffee, and made some great pumpkin recipes last year such as THIS ONE and THIS ONE, but something has come over me this year! It’s like I’ve been zapped by the pumpkin fairy because I’ve been wanting pumpkin EVERYTHING!! My husband has been getting a little annoyed with these pumpkin recipes and the huge stash of canned pumpkin in the pantry…but somehow, he always likes to “taste” everything lol! As you know by now, I’m a choc-a-holic! Chocolate just makes life better! ? I wanted to experiment and combine my two loves; chocolate and pumpkin! 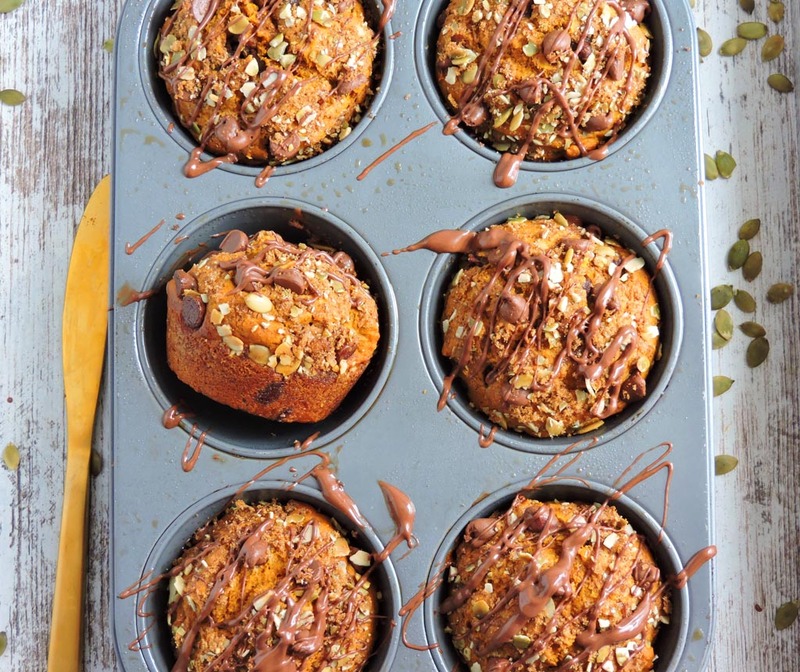 The results were these decadent Chocolate Pumpkin Streusel Muffins! These muffins were so moist and fluffy, and guess what?? I used 1/3 less sugar compared to the average muffin recipe! Soooo I guess this makes this recipe sorta healthy-ish! I usually make standard sized muffins, but this time I wanted huge, coffee-shop sized muffins! Lol! 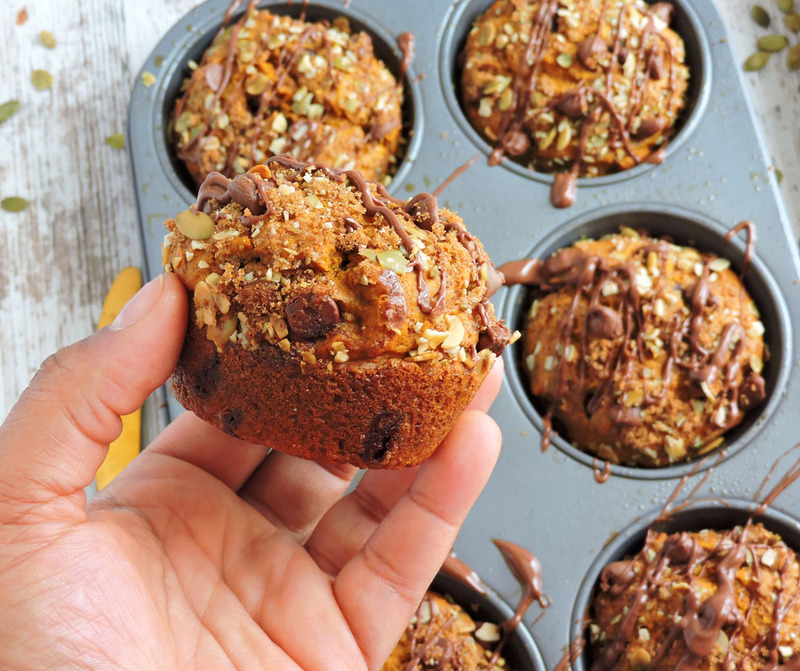 I used THIS oversized muffin pan to make these muffins and they turned out great! 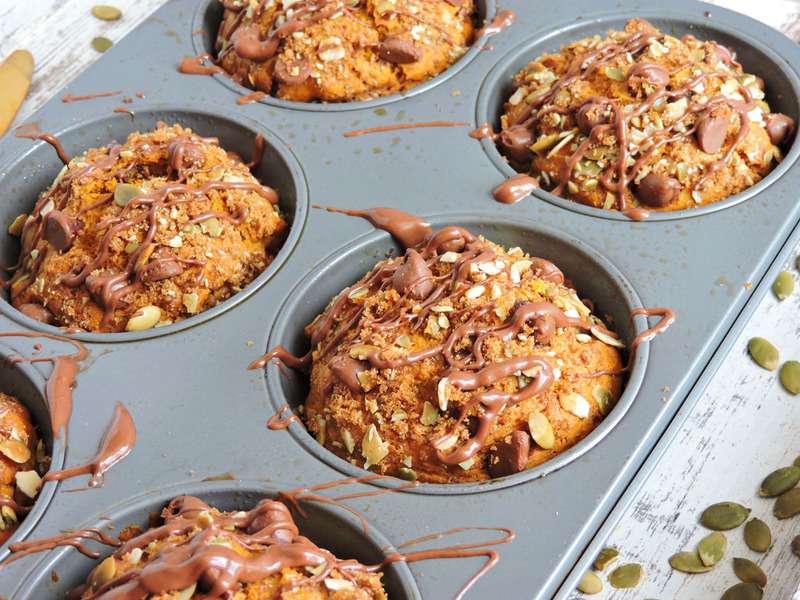 To make these Chocolate Pumpkin Streusel Muffins even more perfect, I topped them with an easy pumpkin seed streusel! It was absolutely delish! Go ahead and give these muffins a try! But I must warn you…you may turn into a pumpkin fanatic like me! Lol! This recipe makes 6 large muffins or 12 standard sized muffins! * Optional: 2 tbsp brown sugar and 2 tbsp of crushed pumpkin seeds for streusel topping. 2 tbsp melted milk chocolate for drizzle. Preheat oven to 350 degrees. Spray a muffin tin with non-stick cooking spray and set aside. In a large bowl, combine flour, baking powder, baking soda, salt, pumpkin spice, and sugar. In a medium bowl, combine canned pumpkin, eggs, vanilla, and oil. 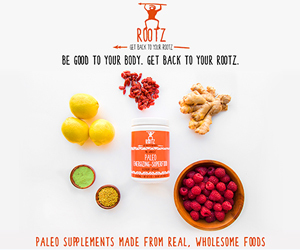 Add wet mixture to dry ingredients and stir until combined. Be careful not to over stir the batter. This can result in tough muffins! Fold in the chocolate chips, and spoon batter into muffin tins. If desired, combine brown sugar and crushed pumpkin seeds and sprinkle on top of each muffin. Bake for approximately 20-25 minutes, or until a fork comes out clean. If desired, drizzle with melted chocolate before serving. Enjoy!